Sometimes, you will want to apply the same processing to multiple Dub tracks. For example, if you have several double tracks and want to apply the same timing to all of them. In the New Process window, there is a Create Multiple Processes option. Using this it's possible to generate more than one process at a time when pressing New Process or the N key. The number of processes to be created is entered in the box (see picture below). 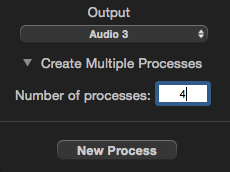 Processes are created on successive output tracks, starting with the one selected, and numbered sequentially. NOTE: Each process created in this step will receive the same settings as in the selected Process Preset. With the Doubler, this is relatively simple and you can indicate how many output Processes will be created from one input (shown below left). The outputs will be the same initially, but you can modify the individual doubler process settings afterwards. With multiple APT generation, it is slightly more complicated as there is one Guide track supplying the features that will be transferred through to multiple Dub track inputs that have been loaded along with the Guide, and each Dub processed creates its own output. 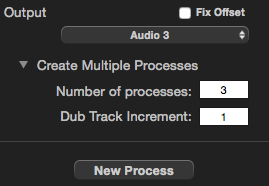 The Dub Track Increment indicates the offset of each Dub track below the first one. The Fix Offset check box maintains the offsets between each Input Dub Track and the APT Output Track. Because this is complicated, a step-by-step tutorial has been included in the APT section. Each time multiple processes are created automatically for a group of tracks, each of the processes will be given the same selected Preset settings. This Preset needs to be set before generating the outputs. If a Preset is not selected, the User Default Preset will be used. However, once the Process Control blocks are created (after processing), the individual processes settings for each output track can be independently modified if required. To edit the settings of each process after it has been created, you need to open the correct Process Control panel that created the output. There are several ways to do this. The simplest ways are to LEFT CLICK the process Output or LEFT CLICK the Dub's Process Control Block. Then press the P key to open the relevant Control Panel where the settings of the process can be changed. A slightly more complex way is to right click on the Process Control Block of the input track in question (in the example below, Audio 1), and select the relevant process name. In the example shown below, two processes have been created for Lead vox (Audio 1), with outputs on tracks Output 1 and Output 2. 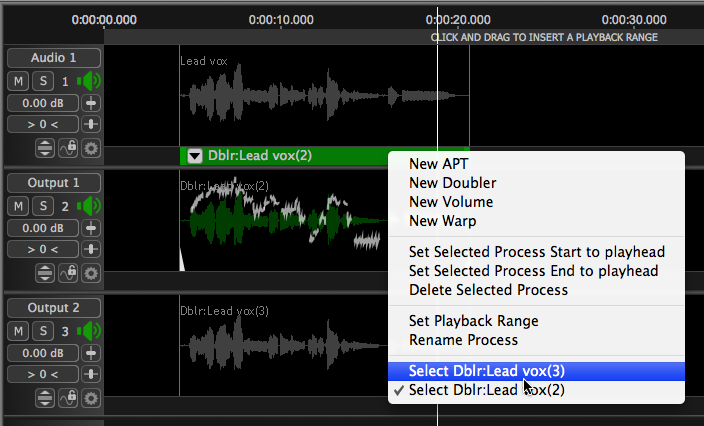 Right clicking on the green process control block brings up the menu shown, where one can select either "Dblr:Lead vox(3)" or "Dblr:Lead vox(2)" and then press the P key to open the Control Panel for that process.